Gujarat High Court has recently held that the contention that when a signed blank cheque leaf is handed over, it can never be filled up and that if it is filled up it would amount to a material alteration within the meaning of using Section 87 of the N.I. Act, does not stand to rhyme or reason. The Court said that it would depend upon the facts of each case. (i) Whether Section 20 of the Negotiable Instruments Act applies to a cheque as well? (ii) Whether filling up of a signed blank cheque leaf would amount to a material alteration within the meaning of Section 87 of the N.I. Act? (iii) Is there an implied authority to a person who receives a signed blank cheque leaf to fill up the same showing any amount as he likes? “It can be argued that when a person takes a bill in an incomplete form, he cannot be a bonafide holder for value since it can only be said that he has taken a piece of blank paper and not a bill and that he can take it as a bill only under the authority given to his transferor. Section 20 of the Act would make it clear that there can be no material alteration of a cheque leaf only for the reasons that it was subsequently filled up. But at the same time it cannot be said that whenever a signed blank cheque leaf is given, it gives authority to the holder to fill up the same according to his whims and fancies. Filling up of a signed blank cheque leaf may not attract section 87 of the N.I. Act, for, there was no insertion, interlineation, erasure, alteration etc, because there was no completed negotiable instrument within the meaning of sections 5, 6 and 13 of the N.I. Act. Therefore, neither section 20 nor section 87 applies to a blank signed cheque leaf. If so, the question must turn round to the actual execution of the instrument. With regard to the instruments other than a cheque, an implied authority is given to the holder at the time of entrusting it to fill up the same. There may be instances where an implied authority is given to the person, at the time of entrusting a signed blank cheque containing the signature of the drawer of the cheque, to fill the columns therein. If a principal or employer deputes his agent or employee to purchase an article and if the dealer fills up that signed blank cheque leaf showing the exact amount covered by the bill showing the price of the article sold then it cannot be said that what was handed over by the drawer of the cheque is only a signed blank cheque leaf. In such cases an implied authority to the trader/seller of the article to fill up the cheque leaf can certainly be inferred. Similarly, there may also be cases where at the time of settlement of the accounts, a particular amount was found payable by the drawer of the cheque to the other party and if a signed blank cheque entrusted to be filled up later is filled up in tune with the accounts, showing the actual amount payable by the drawer of the cheque to the other party, then also it can be said that there was the implied authority to fill up the signed blank cheque leaf. There may be such instances where the sum is ascertainable and the signed blank cheque leaf is given to fill up the same after ascertaining the same. In such cases there would be no difficulty to infer an implied authority given by the drawer. Simply because the cheque is seen filled up or written in the hand writing of another person it cannot lead to a conclusion that only a signed blank cheque leaf was given. 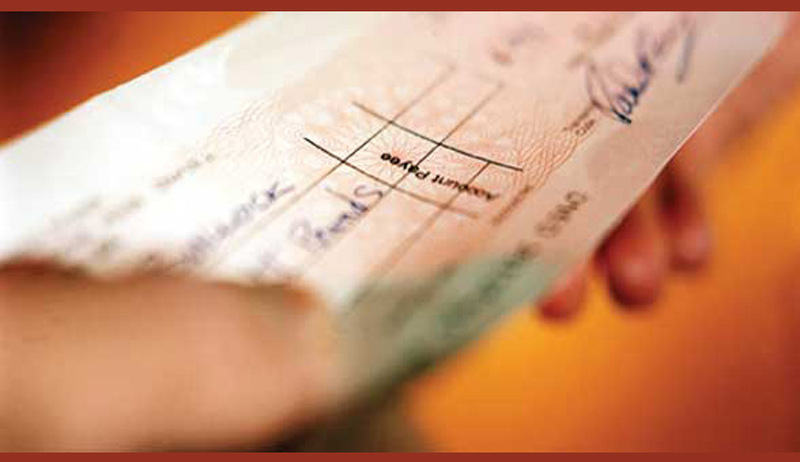 The person signing the cheque may have difficulty due to many reasons to write the cheque and it might have been filled up by the payee or by another. In such cases it cannot be said that what was handed over was only a signed blank cheque leaf. In all such cases the ultimate conclusion may depend upon the proof of the transaction and execution of the instrument. It must also be held that when it is a case that only a signed blank leaf was handed over by the accused, then he must offer satisfactory explanation as to the circumstances under which the signed blank cheque happened to be handed over. Considering the totality of the evidence and circumstances, it is for the court to draw the inference as to whether it was given with an implied authority to fill up the same showing the amount ascertained or ascertainable to discharge the debt or liability. Therefore, there may be such cases where implied authority can be inferred. But the contention that when a signed blank cheque leaf is handed over, it can never be filled up and that if it is filled up it would amount to a material alteration within the meaning of using Section 87 of the N.I. Act, does not stand to rhyme or reason. Similarly, the contention that Section 20 of the N.I. Act is applicable to an unfilled or blank cheque leaf also cannot be accepted. It would depend upon the facts of each case. Therefore, it is neither a case which attracts Section 87 of the N.I. Act nor is it a case where the complainant can rely upon Section 20 of the N.I. Act and contend that as a signed blank cheque leaf is given it gives an authority to fill up the same according to the whim and fancy of the payee. In view of the aforesaid discussion, I am of the view that Section 20 of the N.I. Act would not save the situation as such for the accused applicants. The collective reading of the various provisions of the N.I. Act shows that even under the scheme of the N.I. Act, it is possible for the drawer of a cheque to give a blank cheque signed by him to the payee and consent either impliedly or expressly to the said cheque being filled up at a subsequent point in time and present the same for payment by the drawee”. Finally the Court held that whenever a blank cheque or postdated cheque is issued, a trust is reposed that the cheque will be filled in or used according to the understanding or agreement between the parties. If there is a prima facie reason to believe that the said trust is not honoured, then the continuation of prosecution under Section 138 of the N.I. Act would be the abuse of the process of law. It is in the interest of justice that the parties in such cases are left to the civil remedy.